It has always been an issue in the past, moving contacts, messages, apps, musics, call logs, calendar, photos and videos from your old phone to another. I remember how I struggled to copy my contacts and messages from my Nokia E63 (Symbian Phone) to my Infinix zero (Andriod phone). After I had tried my hands on various software, I was only able to use one of them successfully, which is the Wondershare Mobiletrans. 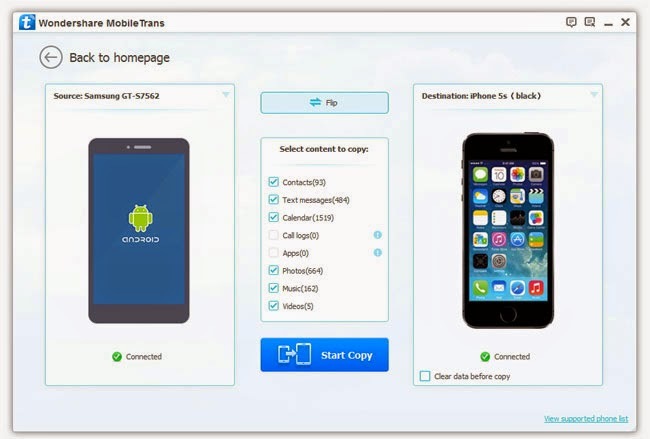 I have been using the Wondershare MobileTrans software to transfer files and contacts from any phone that supports USB to another.Just this morning, I had to move over one thousand (1000) contacts and messages to a client’s newly bought iphone with ease. Today I will be talking about how you can copy all your contacts and messages from Java to Symbian, from Symbian to Andriod, from Andriod to IOS (Iphone) and to windows. Follow all the details provided in this tutorial carefully so you can achieve this. -->Contact me if you need a premium version of Wondershare MobileTrans. Use the comment box below to let me know of your interest for the premium version. There are list of menus there, click on Back up your phone, and continue. Connect the phone you wish to run the back up on and select the content to back up by ticking where necessary. Note that you can successfully back up your phone once it has been fully connected. The screen shot below is the view of a successfully connected phone. You will see the indication “Connected” below the image of the phone on your Wondershare interface. Once that has been achieved, click on the “Start Copy” button and within minutes, your phone would have been backed Up. To restore your back up either to your phone or some other phone, follow the same procedure but select “Restore Back Up” and follow the clue from your back up procedure. Tips: If you are trying to do that on IOS (iPhone,iPad etc) phones, simply make sure you have downloaded and install the itunes application on your PC or you may face challenges. Transfer Contacts, Messages, Videos etc to IOS, Andriod, Symbian, Java etc. There are two methods that can be used. Preferable, you can use the back up method to restore your phone contacts or you can use the phone to phone method where two phones are connected and allowed to share there resources. Before connection (For IOS) makes sure you have correctly downloaded and installed your itunes app on your system. Incase you have not, download itunes App. If you are installing itunes app for the first time, reboot after successfully installation. Launch the Wondershare MobileTrans application on your system and connect your iphone, or ipad. Once that has been done, click on the phone to phone transfer if you are gonna transfer the contacts between two phones. But if you are restoring your back up, click on the “Restore Back Up” and continue. Click on “MobileTrans” to restore back up and wait for the next window to load. You should see the details of your previous back up. Simply tick content you wish to restore and click on the “Start Copy” button. Tips: Turn on USB debugging for Andriod devices if you wish to back up, restore or transfer from your Andriod phone immediately after connecting to the phone to your PC. To turn on USB Debugging on your phone, simply go to Settings + Developer Options + USB Debugging. For Phones like Samsung, LG etc, the developer option is often hidden, to reveal it, go to About Phone + Build Number. Tap the “Build Number” option seven times to reveal your developer option. After that, go back to Settings + Developer Options + USB Debugging to turn on USB Debugging. Tips: Just connect phone to PC and launch Wondershare Software to continue with your transfer. To begin with, install and run Wondershare MobileTrans on your Windows PC. Take out a USB cable to connect your iPhone/iPod touch/iPad/Android device to this Windows PC. When the primary window appears, click Erase Your Old Phone. This brings up the data erasing window. Go to the lower-right corner and click Erase Now. A dialog comes out. Read the tips and enter "delete" in the box. Then, click Start to erase to erase all of your data from your old iPhone/iPad/iPod touch/Android device. Feel free to ask your questions, use the comment box below to do this. I do have windows, android and iphone 5 which I used on daily basis just for fun maybe. Your article is very helpful to transfer contacts. Great post I guess. You have shared a great tutorial here.